I find old church registers interesting documents because they shine a light into the dark recesses of the distant past. They are historical treasures in manuscript form. 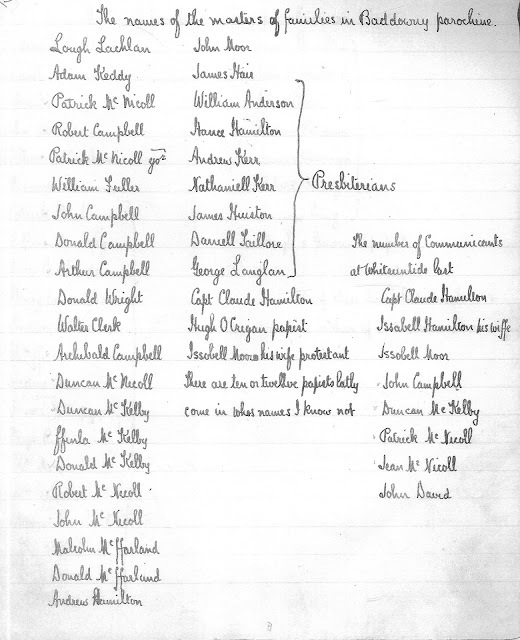 An early register for Ballykelly Presbyterian church is extant and contains baptismal records from 1699 to 1709 and marriage proclamations from 1699-1740 in one small notebook (the original is held in the Presbyterian Historical Society, Belfast). It was kept by the Rev John Sterling minister of the congregation from 1699 to 1752. It is valuable for the light that it sheds on local and family history. Within its pages familiar families abound - Martin of Crindle, Patton of Carrowmena, Douglas of Bovevagh, Morrel of Balteagh, Blair of Dunboe, Buchanan of Banagher and Oliver of Drumachose. The register contains the essence of settlement in the early eighteenth century. The first baptismal entry occurs on Sunday 8th October 1699 when five children were baptised by the Rev. John Stirling (surnames of Cross, Reid, Moore, Rodgers, Culbertson). The Reverend Stirling carefully entered over 600 baptisms in the register for the years 1699-1709 and over 500 marriages for the period 1699-1740. Ballykelly Presbyterian Church served the needs of the congregation over a wide area of the Roe Valley stretching from the parish of Faughanvale in the west to Magilligan in the east. 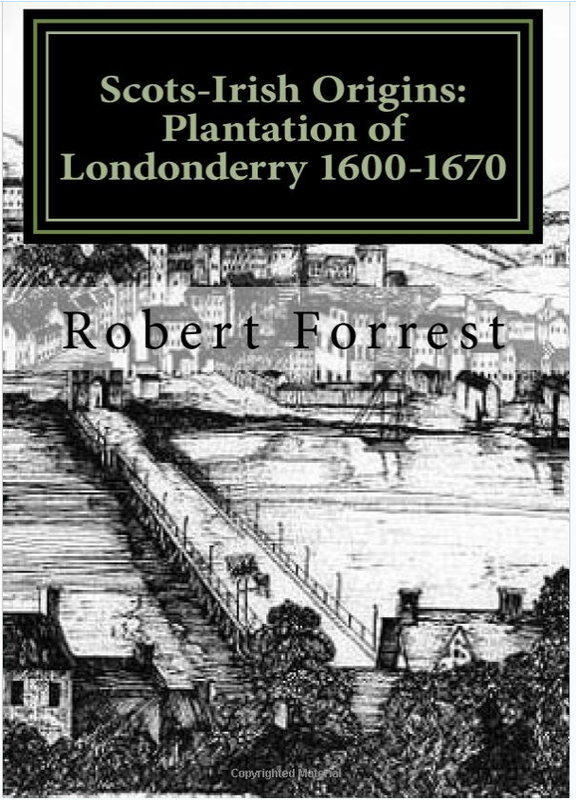 The register reveals close ties between the people of the Roe Valley and those across Lough Foyle in county Donegal and also reveal a remarkably strong connection between Ballykelly and congregations that existed in the wider Coleraine area. Marriages were recorded over a very wide area including counties Antrim, Donegal and Tyrone. 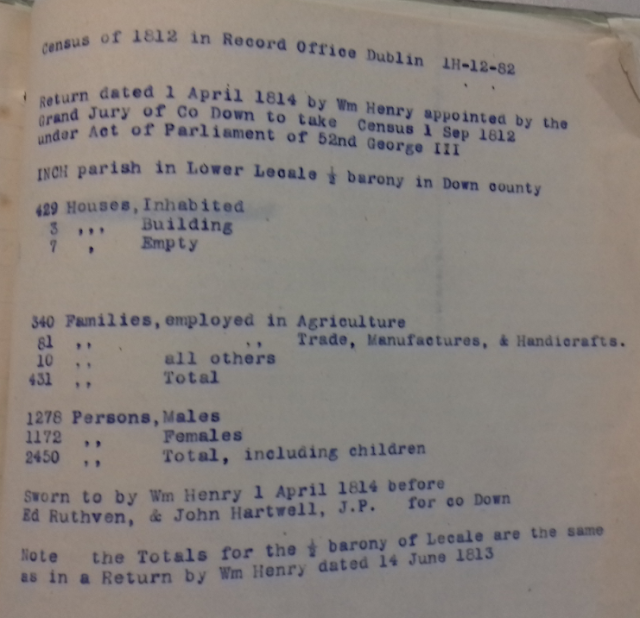 Below is a list of the parishes that were recorded in the marriage register (with numbers of entries). I have not included Ballykelly as the numbers of entries runs into hundreds. Aghadowey (4), Aghanloo (11), Ahoghill (Antrim) (1), Badoney (Tyrone) (1), Ballymoney (Antrim) (2), Ballyrashane (4), Ballywillin (3), Ballyachran (2), Balteagh (22), Banagher (6), Billy (Antrim) (1), Boveedy (2), Bovevagh (28), Burt (Donegal) (4), Cumber (11), Dervock (Antrim) (1), Derryvullen (1), Desteroghill (4), Donagheady (Tyrone) (4), Donaghmore (Tyrone) (2), Drumachose (23), Dunboe (17), Dungiven, (10) Dunluce (Antrim) (1), Errigal (8), Fanad (Donegal) (1), Faughanvale (130), Finvoy (Antrim) (2), Glendermott, (22) Kilcronaghan (1), Killea (Donegal) (1), Killowen (3), Kilrea (1), Londonderry (1), Loughgiel (Antrim) (1), Macosquin (10), Maghera (4), Magilligan (47), Moville (Donegal) (2), Muff (1), Rasharkin (Antrim) (2), Raymoghy (Donegal) (2), Templemore (12). The parishes closest to Ballykelly occur most frequently in the registers. Since there was no Presbyterian congregation in Magilligan (until 1814) many of the locals of the parish worshipped with the Ballykelly congregation or with Dunboe. 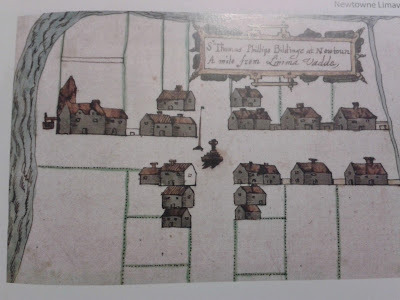 "A treu account of ye persons maried by Mr Jon Sterling Min'r of ye gospel att Ballykelly with ye yeare of God & day of ye month with ye name of ye paroshes wherein ye partys are". The surname Wilson was given double L. Both the w and s are exaggerated letters. With the surname Houstoun we see two forms of the letter U. The u between o and n almost looks like the letter w.
The surname Beer looks like Boor. As mentioned previously vowel formation is difficult to decipher in this register. Notice with the surname Biggert the inverted e and r a which was prevalent in this period. The surname Brisbane is rendered as Brizben in this register - notice the style of the letter z. The surname Flemmie appears frequently in the Ballykelly register. This was the older spelling of the surname Fleming. Here the Rev Sterling appears to have written the surname Laughlin phonetically as Lackland. In this instance local knowledge is key to unlocking the surname. Sherrard is a well known name in Limavady and the Roe Valley. In the earlier records it is often rendered as Sherar or Sheror. I am not sure about this surname but looks like Steal or perhaps Sheal (Shields).